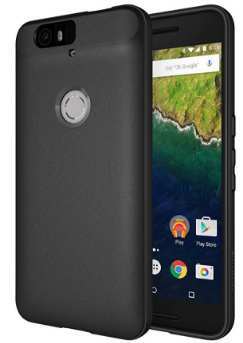 The best Nexus 6p Cases as offered on Amazon, eBay, Walmart and other popular e-commerce sites can help to maintain the look of your current Nexus 6p smartphone. They are of the best quality and as such, can provide an extra layer of protection for the smartphone in a bid to preserve its sleek look and sturdy build for a long period of time. 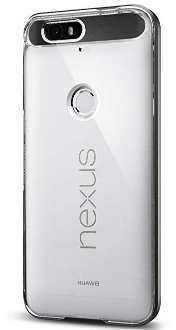 The Nexus 6p tagged Angler, was promoted by Google and manufactured by the Chinese manufacturer, Huawei. As a successor to the Nexus 6, it has an admirable design coupled with some level of durability which can be attributed to its metallic body and Corning Gorilla Glass 4 screen. Nevertheless, it is still susceptible to falls which may lead to cracks that will mar the screen thereby giving it an unappealing look. Here, the simple thing to do is to use a casing which does not add a significant weight or size to the device, but still maintains its sleek look and most of all, can prevent the device from slipping easily from the hands while being operated on. As a result, you can even resell your device at a good price if need be or just have the satisfaction that your phone will not depreciate anytime soon. This is one of the Google Nexus 6P Cases from Spigen and it makes the top of this list for several reasons. Other than its popularity among users of the Nexus 6p, this Two-piece case has a stylish design and durability and it is also very easy to install on the phone. On installation, its soft textured back with faux carbon fiber accents gives the device A comfy feel and a good grip, which makes it suitable for your high-end device. Equally, this casing's borders are slightly raised at the front in order to offer some level of protection to the screen in case it falls and to prevent the phone from sliding off surfaces. At a dimension of 3.5 x 0.8 x 6.3 inches and weight of 2.24 ounces, this Case has a very slim design to give users of the device an ease of usage. Also, the space provided for the fingerprint sensor can be used conveniently without having to deal with intruding sides. Clear flexible TPU shell and a hard PC bumper. 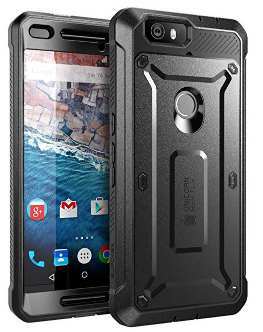 Spigen Rugged Armor case is also compatible with the Huawei Google Nexus 6p smartphone. For its sturdy build and slim design, there is a single-layered TPU material that retains the sleek design of this smartphone. Its carbon fiber textures give it a firm grip when held. Moreover, you can use it alongside a glass screen protector without the Case looking out of place. Available in only black color, there are not a range of colors to choose from, hence users will have to settle for black. Also, having stiff control keys might make it a little difficult to operate with ease since both volume and power buttons can be operated simultaneously. Asides these downsides, its raised screen and camera lips as well as exact cutouts for the USB and headphone ports help to maintain the functionality of peripheral devices. 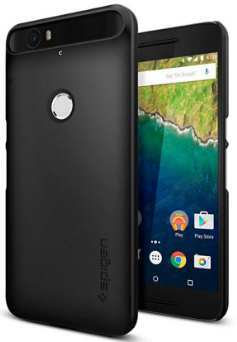 A belt clip holster Case for the Huawei Nexus 6P is the Supcase unicorn beetle pro. This is a two-layer Case with a rugged design, shock absorption, and scratch prevention to give it a sturdy feel and protect against scratch and cracks. Mainly designed for the Nexus 6p, this Case may not be compatible on other devices such as the Nexus 5X. This Case is made of polycarbonate and thermoplastic polyurethane for shock absorption and it has a rotatable belt holster to make the device easy to carry about. Its dimension of 6.7 x 4 x 1.5 inches and weight of 4.8 ounces makes it slightly larger and heavier than other Cases you may find. Thus, you may have a little bit of size to worry about if you're looking for a casing that is as discrete as possible. Available in blue, black and white colors. 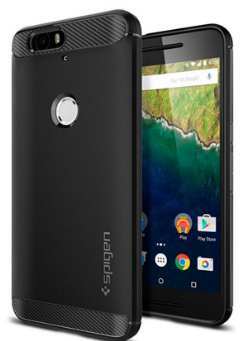 Here's one more Nexus 6p case from Spigen and it is one of the most remarkable for its weight and size. That is to say, while it serves to protect your phone from scratches, it also strives to do so without adding any significant weight. At roughly 15.9 x 4.7 x 27.6 inches and 1.6 ounces, you can still operate your phone with ease, carry around, and fit into a pocket. Additionally, its correctly sized cutouts for visor, buttons, and ports helps to maintain functionality. Its raised bezels help to lift the phone's screen as well as the rear camera off flat surfaces in a bid to prevent scratches. In terms of color options, you can find this Case in either black or white color. Now, you may also want to try out the Nexus 6P Full Matte TPU Case by Diztronic because it also comes highly recommended. It has a slim build and weighs very little, thus it will not feel like a huge chunk of material around the phone. Also, there is also its durability to consider since this case comes with a TPU for shock absorption and scratch resistance and it has not been sprayed to avoid wear off with time. In the same vein, you can install or remove this flexible Case for the Nexus 6p with ease. The dimension of this Case is 2.4 x 0.1 x 1.3 inches and its weight is 0.96 ounces. Also worthy of note, is the fact that fingerprints are not visible on this Case, thus you don't have to deal with oil or dirt on its surface. These are the best Nexus 6p Cases in 2018 that can ensure that the outer appearance of your smartphone is maintained for a long period of time. They prevent scratches on the phone and as such, you can drop your phone on any surface be it smooth or rough without worrying about the negative effects. The next thing to do is to acquire one of these nexus 6p cases from Amazon which will be delivered to you in Canada, other states in the US and even worldwide.